I will be speaking at the Annual Conference of the Middle East Insitute, Washington DC this year on 21 November 2008. Only in Pakistan does the appointment of a new spy chief elicit more commentary than, say, a Prime Minister under today’s political system, where the presidency holds the power strings. The appointment of Lieutenant General Ahmed Shuja Pasha as the new head of the Inter Services Intelligence earlier this week has raised expectations about a change in the direction of the ISI and Pakistan in the war against terror and militancy in the borderlands with Afghanistan and inside Pakistan proper. While the changes in leadership of the army in general and at ISI by the new army Chief General Ashfaq Parvez Kayani hold much promise, military actions alone do not guarantee a change in direction of the fractured economy and polity of Pakistan. Without a clear sense of understanding and control by the civilian government of all aspects of governance, Pakistan risks muddling through a crisis that may worsen in the days ahead. On the Afghan border, the risk of confrontation with the United States remains. Inside Pakistan, the militants are on the prowl and challenging the writ of the state. First, this is the formal assertion of power of the new army chief, who will complete his first tumultuous year in office this November, a year marked by the assassination of Prime Minister Benazir Bhutto, the holding of relatively free and fair elections, largely because the army provided security and refused to be drawn into the political process, and the formation of a short-lived coalition between the Pakistan Peoples’ Party and its erstwhile arch rival the Pakistan Muslim League of Prime Minister Nawaz Sharif. Finally the past year saw the abrupt departure of President Pervez Musharraf, who once he had shed his uniform, lost his grip on power. He was succeeded by Asif Ali Zardari, the widower of Ms. Bhutto, who has taken firm ownership of her party. Throughout all this, General Kayani maintained a quiet but firm posture, stating repeatedly but not too often to provoke disbelief that he wished the army to return to its professional roots and leave governance of the country to the elected civilians. In a country that has seen too many army chiefs change their minds about this relationship with the civilians, many still believe that he may either change his stance or be forced to do so by deteriorating circumstances in the country. The issue that will continue to bedevil decision making at the ISI and in the civilian government in Islamabad is whether Pakistan will finally take a firm position against the Afghan Taliban, who, unlike the TTP, have till now not been seen as taking a hostile position against the army or the government of Pakistan. They rely on tribal affiliations to enter and exit from FATA surreptitiously; avoiding any battles with Pakistani army of Frontier Corps (FC) elements. Will Pakistan now take affirm position on dealing with them, telling them in effect; “You can come into FATA but cannot leave then to fight in Afghanistan”. If they refuse, Pakistan’s army risks opening yet another front in the counterinsurgency in its frontier region. IS it capable of doing that? Pasha understands very well the shortcomings of the army, the FC, the local civil administration in FATA, and provincial and central governments in the war against the militants. In a long interview with me this summer, he explained the weaknesses of the system in place now and what the army is trying to do to shore up its end of the fight. But he described the need for a three-pronged strategy involving “development, political, and military” and analyzed the relative strengths and weaknesses of each part of this troika. His frustration with the lack of will of previous governments at the center and the provinces was palpable, as was his criticism of military actions that were not coordinated with and supported by development efforts. The absence of promised development assistance from the United States figured in his narrative as did the inefficiency of civilian bureaucracies that failed, in his words, to assess the situation with on-site visits in the FATA and application of funds to meet the urgent and basic needs of the people. Pasha’s own previous experience as head of the UN peacekeeping force in Sierra Leone informs his sensibilities about dealing with conflict and post-conflict situations. Like other generals and officers in the field in FATA and Swat, Malakand, and Dir inside the North West Frontier Province itself, he echoed the view that the army needs to avoid civilian casualties “since we are fighting inside Pakistan, against our own people”. The US needs to understand this reality too. The Pakistan army is not equipped for the counterinsurgency. Its training is for conventional war. So is its equipment. It lacks adequate night vision goggles and attack helicopters and heli-lift capabilities, for example. The United States has promised to replace its outmoded ogles with newer more effective models and has offered some Cobra helicopters but not all of them have been delivered. Some are still being refurbished. The militants attack isolated posts in small numbers. The army cannot reach those spots in a hurry with enough troops to catch and destroy them when they are visible. The US needs to find ways of providing Sikorsky Blackhawks or even third party sales of MI-8 or MI-16 troop-lifting helicopters to meet Pakistan’s needs. It is replacing its own Blackhawk fleet with newer models. Even refurbished Blackhawks are better than none for Pakistan. While Pasha will no longer be involved in the operational planning and preparedness of the army, he will be at the frontline of the dealings with the militants groups in the field. How he handles the relationship with the Afghan Taliban will be key to his success. He foresees the need for a tripartite relationship between the Political Agents, who represent the government in FATA, some Maliks, and the Mullahs or moderate elements of the Taliban. By bringing in the moderates he sees the chance to isolate the radicals. At the same time be recognizes that the age-old system of PAs and Maliks running the affairs of FATA cannot be resurrected. Things have changed on the ground and the people of the region are much more politically aware and active. Pasha also does not see a potential convergence between the Afghan and the local Taliban. The civilian head of the Ministry of Interior, Rehman Malik, has been reported to as seeing a lack of difference between those two groups. In July, Malik was at the center of a controversial move to bring the entire ISI under the control of his ministry. How will this relationship now develop between Pasha and Malik? Pasha has been closely involved in Kayani’s frequent exchanges with the US commanders in the region and the chairman of the Joint Chiefs of Staff, Admiral Michael Mullen. He was the one that Kayani took with him to the meeting on the USS Abraham Lincoln in the North Arabian Sea. 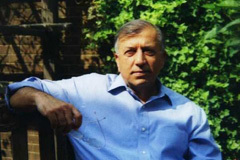 Shuja Nawaz is the author of Crossed Swords: Pakistan, its Army, and the Wars Within. He can be reached at shujanawaz.com. Only in Pakistan does the appointment of a new spy chief elicit more commentary than say a Prime Minister under today’s political system, where the presidency holds the power strings. The appointment of Lieutenant General Ahmed Shuja Pasha as the new head of the Inter Services Intelligence earlier this week has raised expectations about a change in the direction of the ISI and Pakistan in the war against terror and militancy in the borderlands with Afghanistan and inside Pakistan proper. While the changes in leadership of the army in general and at ISI by the new army Chief General Ashfaq Parvez Kayani hold much promise, military actions alone do not guarantee a change in direction of the fractured economy and polity of Pakistan. Without a clear sense of understanding and control by the civilian government of all aspects of governance, Pakistan risks muddling through a crisis that may worsen in the days ahead. On the Afghan border, the risk of confrontation with the United States remains. Inside Pakistan, the militants are on the prowl and challenging the writ of the state. The issue that will continue to bedevil decision making at the ISI and in the civilian government in Islamabad is whether Pakistan will finally take a firm position against the Afghan Taliban, who, unlike the TTP, have till now not been seen as taking a hostile position against the army or the government of Pakistan. They rely on tribal affiliations to enter and exit from FATA surreptitiously; avoiding any battles with Pakistani army or Frontier Corps (FC) elements. Will Pakistan now take a firm position on dealing with them, telling them in effect; “You can come into FATA but cannot leave then to fight in Afghanistan”. If they refuse, Pakistan’s army risks opening yet another front in the counterinsurgency in its frontier region. Is it capable of doing that? The Pakistan army is not equipped for the counterinsurgency. Its training is for conventional war. So is its equipment. It lacks adequate night vision goggles and attack helicopters and heli-lift capabilities, for example. The United States has promised to replace its outmoded goggles with newer more effective models and has offered some Cobra helicopters but not all of them have been delivered. Some are still being refurbished. The militants attack isolated posts in small numbers. The army cannot reach those spots in a hurry with enough troops to catch and destroy them when they are visible. The US needs to find ways of providing Sikorsky Blackhawks or even third party sales of MI-8 or MI-16 troop-lifting helicopters to meet Pakistan’s needs. It is replacing its own Blackhawk fleet with newer models. Even refurbished Blackhawks are better than none for Pakistan. While Pasha will no longer be involved in the operational planning and preparedness of the army, he will be at the frontline of the dealings with the militants groups in the field. How he handles the relationship with the Afghan Taliban will be key to his success. He foresees the need for a tripartite relationship between the Political Agents, who represent the government in FATA, some Maliks, and the Mullahs or moderate elements of the Taliban. By bringing in the moderates he sees the chance to isolate the radicals. At the same time be recognizes that the age-old system of PAs and Maliks running the affairs of FATA cannot be resurrected. Things have changed on the ground and the people of the region are much more politically aware and active. Pasha also does not see a potential convergence between the Afghan and the local Taliban. The civilian head of the Ministry of Interior, Rehman Malik, has been reported as seeing a lack of difference between those two groups. In July, Malik was at the center of a controversial move to bring the entire ISI under the control of his ministry. How will this relationship now develop between Pasha and Malik? Pasha has been closely involved in Kayani’s frequent exchanges with the US commanders in the region and the chairman of the Joint Chiefs of Staff, Admiral Michael Mullen. He was the one that Kayani took with him to the meeting on the USS Abraham Lincoln in the North Arabian Sea.